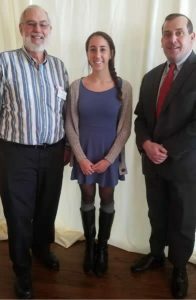 On March 8, 2018, Ali Schrager was awarded the first Rotary Club of Trenton quarterly scholarship, and was presented with a check for $500 at the weekly meeting at Trenton Country Club. Ali is a fine example of the community service -minded students for whom this scholarship is established. She is a volunteer choreographer working with under-served local children through her association with the Trenton Thunder and their dance team. She has also won several awards for her community service in support of the Leukemia and Lymphoma Society, Christine’s Hope for Children and others. She is also an honor student at Hopewell Valley Central High School and will be attending Wake Forest University this fall, majoring in Applied Mathematics.